B.M. Birla Heart Research Centre, Kolkata is no doubt the best Hospital in Kolkata for getting treatment on Cardiac (Heart) related diseases. India’s 1st NABH accredited Hospital B.M. Birla Heart Research Centre of Kolkata is offering subsidized package on Coronary Angiography for the Heart Patients on the World Heart Day 2012. Let’s check out few more details of B.M. Birla Heart Research Centre Kolkata’s special offering to heart patients. • B.M. Birla Heart Research Centre, Kolkata Initiative details: - B.M. Birla Heart Research Centre, Kolkata is going to celebrate World Heart Day 2012 i.e., 29th September 2012 (Saturday) by offering subsidized package on Coronary Angiography for the Heart patients. This is a CSR initiative of B.M. Birla Heart Research Centre, Kolkata especially for the Underprivileged Heart patients. • How to register yourself to avail the special package of B.M. Birla Heart Research Centre, Kolkata? Heart patients can register for this special subsidized package on Coronary Angiography [will be organized on 29th September 2012] at B.M. Birla Heart Research Centre Kolkata. Heart patients should register on first-come-first-service basis by 26th September 2012 till 7pm. If further investigations & treatments are advised then B.M. Birla Heart Research Centre Kolkata will ensure priority service at reasonable rates. Check terms & conditions at www.birlaheart.org website. Please call 9007033017 between 10am & 6pm to know more about the terms & conditions and to avail this special package announced by B.M. Birla Heart Research Centre, Kolkata. Address: 1/1, National Library Avenue, Alipur, Kolkata-27. 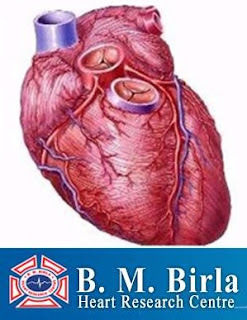 Phone number: 24x7 Cardiac Emergency Heart-line number 033-3040-3040 [Email: bmbhrc@birlaheart.org]. Do you know that best things in life are not seen by eyes; but felt by the Heart? So, don’t miss the opportunity given by B.M. Birla Heart Research Centre, Kolkata on 29th September 2012 (World Heart Day) and check your heart by the specialists.